I’ve had the opportunity to meet and talk music with some great talents in the music industry. Little did I know that a young talent lived only a couple of miles from my house in Bedford, Nova Scotia. Sixteen year old songwriter Richard Wile contacted me on Facebook after seeing an article a local newspaper did about me last week. A Mac user himself, Wile asked if I would take a listen to a new album he just released. I’m not quite sure what I expected, but a soulful blues-based album would not be on the top of my list. That, however, is just what I got. The instrumental album features Wile playing guitar and bass and his girlfriend Taylor Sutherland playing keyboards. He also plays trumpet, harmonica, mandolin, and banjo, as well as dabbles in keyboards and piano. All of the other instruments on the album, including drums and percussion, came from GarageBand's Jam Packs. Wile recorded and mixed the entire album using GarageBand, Native Instruments' Guitar Rig (to model his guitar tone), and a MacBook that he has set up in his basement. The tune that started it all is a song called “Letters to John,” which he started almost three years ago. 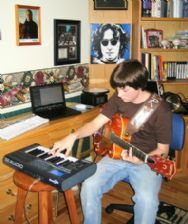 The song is inspired by one of his musical heros, John Lennon. The bluesy music he wrote was understandable after talking to him about his influences: Eric Clapton, R.E.M., Cream, The Police, John Lennon, The Killers, and James Taylor topped the list. Wile has 30 guitars, including a few Gibson Les Pauls and Fender Strats, as well as six amps. Wile’s album is available from iTunes and several other online music stores. On iTunes, the DRM-free album costs $7.92.